The iam8bit art exhibition kicks off its fifth year of breathing twisted new life into 80's gaming icons with its biggest show yet, so expansive that it can only be called SUPER iam8bit. iam8bit first paraded works of art inspired by classic video games about back in 2005, proving to many that not only are video games art, they've served as inspiration to some of the finest artists of the modern day. A three-year hiatus and three shows later and the organizers are preparing for show number five, a spectacle so expansive it required an adjective in all caps! SUPER iam8bit open on August 11 at the show's 4,500 square foot exhibition area in Echo Park, Los Angeles, running through September 10. Visitors can expect to see a tribute to 30 years of Galaga featuring the world's largest arcade cabinet, and interactive, retro Kinect hack from Double Fine's Drew Skillman, and works from more than 100 global artists. 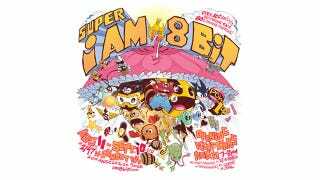 "SUPER iam8bit will be the most vibrant celebration of interactive entertainment through art to date," Jon Gibson, co-curator of the show, remarked. "We are equally excited about our new book, which will be an incredible showcase of the artists and works that we display at the show, and allow anyone not in the Los Angeles to experience the intimacy of being in the gallery." And yeah, if you can't make it to the show, you can always buy the brand-new SUPER iam8bit book, with more than 160 pages of glorious video game-inspired work, putting the previous book (which has a place of honor in my bathroom) to shame. Visit the show's website for details on how you can appreciate the greatest video game art exhibit I am personally aware of.